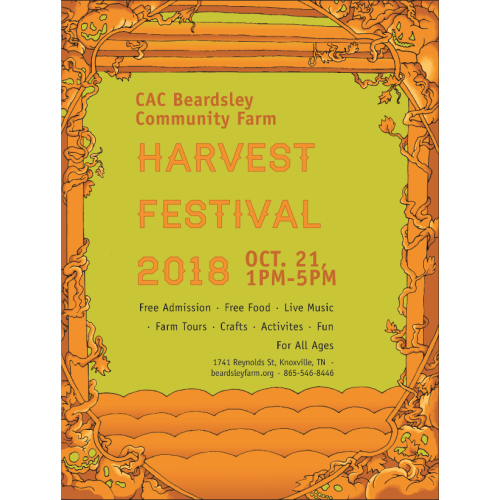 Come celebrate the fall harvest at CAC Beardsley Community Farm with a free, family-friendly community event on Sunday, October 21st! Harvest Festival will celebrate the farm, the community, and all things fall. Enjoy free food, children's activities, live music, and tours of the farm. Parking will be available in front of our Education Center, at the Wesley House, Mobile Meals, and the Ed Cothren Pool. Come dressed in your Halloween costumes! Free Food! Chili and bread! Greens! Ice Cream! Halloween Candy! Children’s Activities! This event is perfect for kids! Children's activities will include paper hats, face painting, ring toss, nature crafts and more! There’s something fun for every child to enjoy. Don't forget that Halloween costumes are encouraged! Live Music and entertainment! Lineup coming soon.